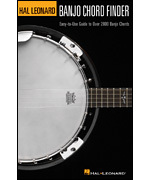 The Banjo Chord Finder is an extensive reference guide to over 2,800 banjo chords, covering four of the most commonly used tunings. Thirty different chord qualities are covered for each key, and each chord quality is presented in two different voicings. Also includes a lesson on chord construction and a fingerboard chart of the banjo neck! Also available in a 9 inch. x 12 inch. edition (00695741, $5.95).